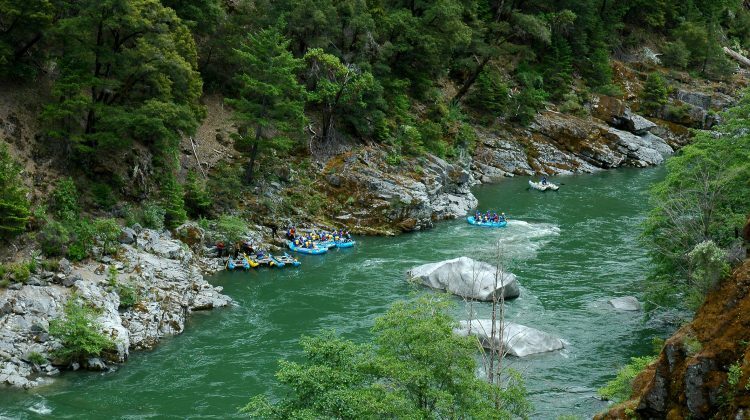 The Wild and Scenic California Salmon River, although still somewhat unknown even in its home state of California, is one of the most incredible class V whitewater rafting trips in the country. This is one of Momentums original and most loved spring trips, and, for many of us, the “Cal Salmon” is our favorite class V river in the U.S. It combines beautiful, lush coastal scenery, an intimate, marble-smooth, granite inner gorge, a seemingly endless number of waterfalls cascading in from above, emerald-green waters, tons of wildlife, a comfortable pop-up base camp, and unequaled class IV-V pool-drop whitewater. This is truly a world-class, high-adventure whitewater run. 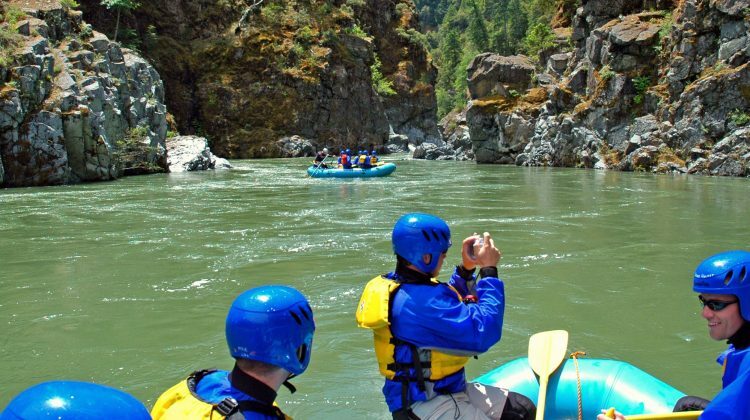 Our trip combines the Salmon with the Class V Scott River and/or the spectacularly beautiful Clear Creak to become one of the ultimate class V adventures in the country. The Salmon has become our signature spring trip and we run more people down this river then all other companies combined. It is our “back yard” big water spring river. The area is a whitewater playground and our itineraries allow for the time and flexibility to truly see the best this incredibly wild and remote river system has to offer. And we access it all from our comfortable safari-style pop-up base camp – combining high adventure and comfortable glamping style camping. Please call if you have any questions about this amazing adventure! Remote and internationally recognized for its biodiversity and wild rivers, California’s far northwest corner is hidden about halfway between San Francisco and Portland, Oregon – many miles from any cities. The river is a major tributary of the Klamath, cuts a deep and rugged canyon between the Marble Mountains and the Trinity Alps, and drains moderate-elevation, high-precipitation areas. Included in the drainage is the Sawtooth Glacier, the only glacier in California’s coastal range. The California Salmon River is also dam-free from its source to its confluence with the Klamath. It is a truly ‘out there’ place and every spring small groups of guides, “whitewater junkies”, and adventurous new river runners make the pilgrimage to the Salmon. The lushness of the canyon is a refreshing change from the drier, more desert-like landscape of many California rivers. Also outstanding is the abundance of wildlife; it is not uncommon to see black bear or the occasional mountain lion, and meeting up with deer and a wide range of birds is almost a given. The combination of stunning scenery and remote location lends itself to creating a feeling of being set down in a different part of the world. You quickly become immersed in the area and the experience. Each afternoon we will head back to our comfortable riverside ‘pop-up’ base camp set deep in the Salmon River canyon. There are walk-in tents with cots set among the trees, a tented eating and hang out area, and there is always a big fire burning. The late afternoon can be spent hiking, biking, playing games in the sun, having a drink around the campfire, or just hanging out in a hammock. For those who like road and mountain biking (and have the energy after a hard day of paddling) the narrow and remote roads in the area offer beautiful riding. The evening will start with appetizers, a big dinner, and desert, and be followed by a comfortable night under a sky far away from any city lights. Even if you took away the scenery, the location, and our camp, the whitewater would still make the river more than worthwhile. The rapids are an amazing combination of crashing waves, big holes and boulders, and clean, steep drops over smooth granite. Best of all, there are a ton of them. The California Salmon’s whitewater lends itself to paddlers of all experience levels. For adventurous beginners and intermediates in good physical condition, the various river stretches allow you to start with a day of class IV before moving on to the class V. For experienced rafters – even those who have boated all over the world – the rapids are more than challenging enough to keep the adrenaline going. Most importantly, they are incredibly fun! So join us for the “pilgrimage” that many of our guests take year after year to the wild lands of the far northwest corner of California. Join us for some of the most classic and incredible advanced whitewater in the world, comfortable nights under huge coastal mountains, time with old and new friends around the campfire, and a chance to get away from wifi, cell phone chatter, and hectic daily schedules. Please note: Depending on water levels you may be asked to participate in a class-V paddler’s test. These tests are not competitive or macho. They are done to emphasize teamwork, confidence, and to help you judge your ability to tackle this incredible stretch of river. Please call if you have any questions or concerns.